At the close of the nineteenth century, no American zoo had found itself able to display the largest marsupial predator of modern times, the thylacine (Thylacinus cynocephalus), and concern about the animal's increasing rarity in its native Tasmania was mounting. At the urging of the National Zoo in Washington D.C., an American official stationed in Australia finally arranged for a wild-captured thylacine to be shipped to the United States in early 1902. This female thylacine was pregnant when captured, and soon after, in April, gave birth to three tiny, naked pouch young. After months of crated transport, first by boat across the Pacific and then by train across the American continent, the thylacine mother arrived at the zoo on September 3 with her three offspring, by now furred and the size of rabbits (Fig. 1). Ill from the long journey, one of the cubs died nine days later. The mother lived for two years at the zoo, and her two remaining offspring, male and female, survived into adulthood. 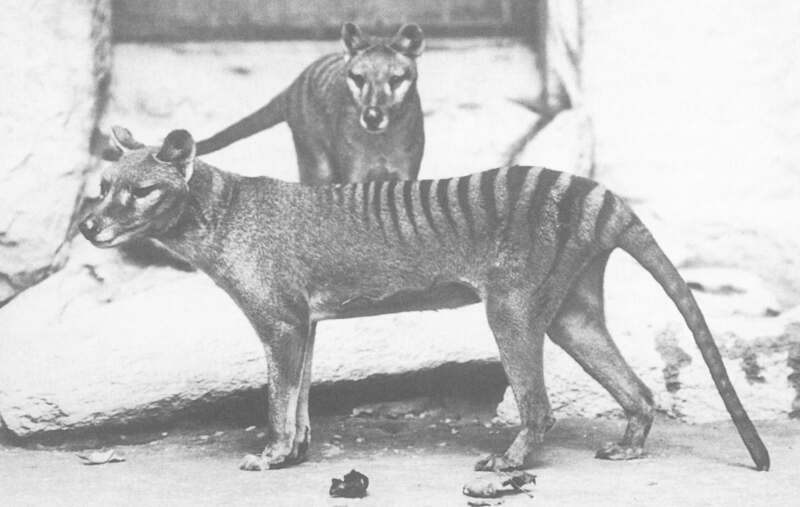 More details about the thylacine family's history can be found in a paper by Chris Wemmer. Figure 1. A 1902 painting by Joseph Gleeson depicts a thylacine mother with three cubs (including one in the pouch) as they appeared on arrival at the National Zoo (photo courtesy of Smithsonian Archives). Our study sampled hairs from the mother and one of the cubs. 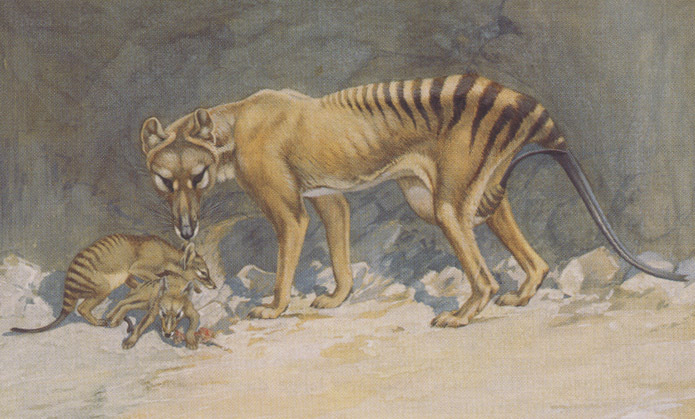 This particular thylacine family has loomed large in the study of the species, both in life and death. The longer surviving offspring, subjects of one of the most famous photographs of the species (Fig. 2), provided a very rare example of thylacine young surviving to maturity in a zoo. When the zoo obtained another, adult male thylacine from Tasmania in 1904, the surviving daughter was the subject of one of few attempts at captive breeding, ultimately unsuccessful. All of these thylacines are today preserved as specimens in the United States National Museum of Natural History (USNM), Smithsonian Institution, where they have been studied by several generations of comparative morphologists. The mother, on display at USNM as a taxidermy mount since 1904, can still be viewed in the museum's public galleries, where it has been seen by tens of millions of visitors. Notably, the accompanying skeleton of this specimen has been the subject of previous efforts to obtain thylacine molecular sequence data using ancient-DNA protocols, and the USNM thylacines provide a partial focus for our study as well. Figure 2. Among the highest quality of known thylacine photographs, this portrait apparently depicts the two surviving offspring (see Fig. 1) two to three years after their arrival at the National Zoo. One of these animals (most likely the one in front) is USNM 125345, a specimen sequenced for this study (photo courtesy of Smithsonian Archives). The first Smithsonian specimen we investigated was the mother, USNM 124662 (skin) / 49723 (skull), adult female, which died at the National Zoo in 1904. We sampled < 0.1 gram of hair from the left side and the hair tufts between several toes, without appreciable damage to the skin. The right side of the skin was left fully intact. 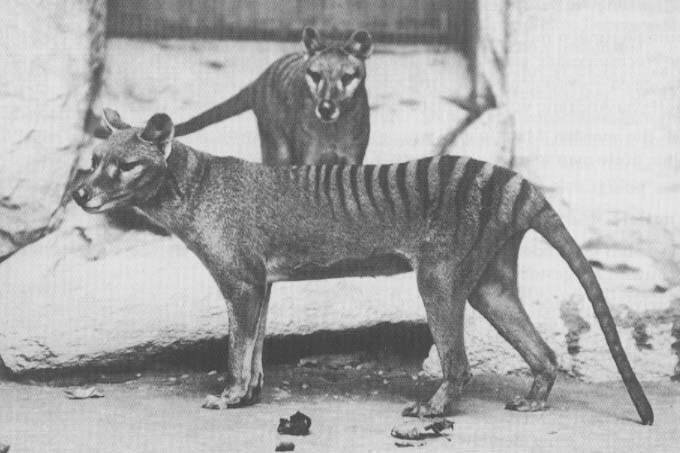 This had been used in an earlier unsuccessful study by other authors, and we were unable to recover thylacine DNA from it. Our second attempt used the specimen that was the offspring (son) of the first specimen. The same mitochondrial sequence is of course to be expected, since mitochondrial genome sequences are inherited solely from the mother. This specimen was USNM 125345 (skin) / 49724 (skull), adult male, which died at the National Zoo in 1905. The skin of this specimen is prepared as a scientific study skin; it is housed in the USNM scientific collections and has not been on display since its death. We sampled approximately 0.01 gram of hair from the right side of the skin and from the hair tufts between the toes on the right hindfoot, without appreciable damage to the skin. The left side of the skin was left fully intact.